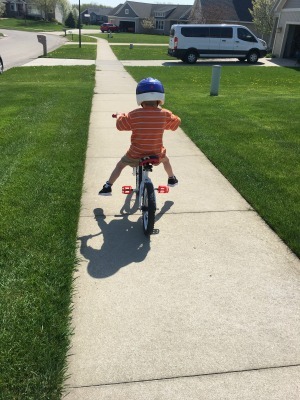 Teaching your child to ride a bike can be a stressful time met with tears, frustration, and even a strained relationship in some cases, but as a mom of 9 I can tell you, it doesn’t have to be that stressful! In fact, it can be super easy and even fun once you know the trick to getting it done. What’s even better is there doesn’t even need to be any tears, falls, or aching back for you! Teaching kids to ride a bike without training wheels has never been easier once you know these easy bike riding tips. I will admit I was skeptical at first. It wasn’t until I was teaching my 5th child to ride a bike that I actually took the time to try this method. Wondering how to manage kids screen this summer? We’ve got an AMAZING screen time guide. Just tell us where to send it below! Success! Now check your email to grab your download and subscribe for other awesome freebies, too! Here’s how teaching children to ride a bike has never been easier. I first used these tips around the time that these bikes came out, but I wasn’t about to spend that kind of money on a bike when I knew I could create by own version diy style. With this in mind, we got started. If they don’t have the desire, their fear will get in the way. Kind of like potty training, you can’t want it for them when they don’t want it for themselves. Or if you do, expect plenty of tears and frustration. We started with a 12 inch bike, which was a smaller bike than my son had actually been riding. But, the smaller the bike, the closer they are to the ground and the easier it will be for them to control the bike as well. These are usually pretty easy to remove, and by taking this step you are making your own balance bike diy. You want to find a gentle hill – ideally a long one. This way they can move without having to push themselves along at all. As they start going down the hill, your child’s feet will need to be straight out to the side, about 2-3 inches off the ground. This will allow your child to easily bring themselves back to a point of balance if they start leaning to one side or the other. This is why those balance bikes are given their name. In essence, learning to ride a bike is a matter of learning to balance on a bike. The beauty of having the pedals off the bike means that they can focus only on the balance without the pedals getting in the way. Continue having your child go down the hill, going a little faster each time. Your child will have to feel comfortable with balancing their bike at various speeds, including a faster pace. You will want them to master the art of turning with the pedals still off. Being able to turn now will make turning with the pedals on a cinch. Once they have mastered the balancing aspect at all speeds, they are ready to put the pedals back on. They still get started on the hill, but they can move their feet on the pedals as they begin losing speed. They should easily be able to pedal now that they have mastered the art of balancing. It’s so fun to see – they will just take off! The next step is to have them learn to turn on their bike with the pedals. Having mastered this without pedals, this should also take next to no time. This is a necessary skill, but it doesn’t usually take much time at all. Once your child already learned to balance, using brakes is a cinch! 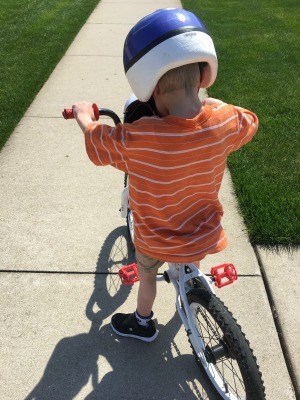 If you’ve been nervous to teach your child to ride a bike without training wheels, no more! 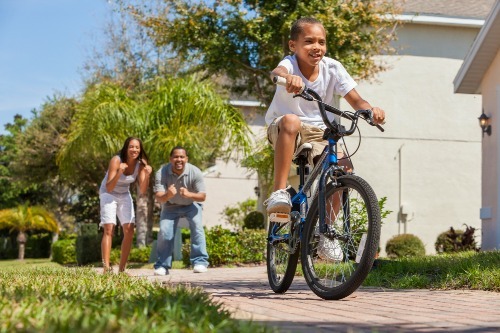 These bike riding tips will make the entire process quick, easy & painless for parents and kids!